Starcraft Marine of New Paris, Indiana has been around seemingly forever building pleasure boats in both fibreglass and aluminum and is huge and diverse in its offerings. From small aluminum jon boats through fishing boats, runabouts, deck boats, to pontoon boats, (and even more) Starcraft offers a staggering ninety-one boat models in twenty-seven series in a total of eight different boating categories! 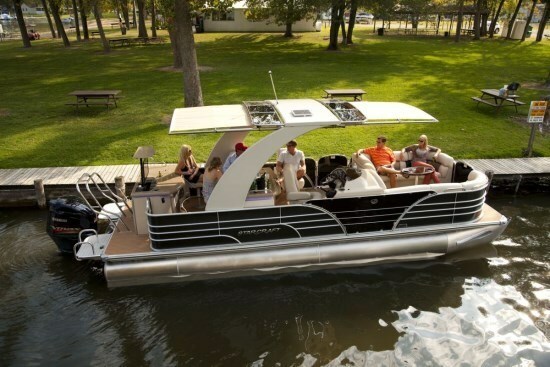 Starcraft’s pontoon boat division alone offers thirty models in four series from nineteen through to almost twenty-seven feet in overall length for 2013. The 256 Starliner, subject of this review, is one of six models in the upscale Majestic series which itself offers two overall lengths – 24’10” and 26’10” – the 256 Starliner having the latter (longer) overall length and a beam of 8’6”. As Starcraft describes it, “In a Majestic, we spared no expense to spoil your whole family. Majestic's 256 Starliner offers outstanding quality. With a raised helm console, thick, plush, 42ml soft touch vinyl, and a host of exceptional standard features, the Majestic 256 Starliner is perfect for a day of luxury cruising.” This luxury cruising can be done with a rated total of fourteen persons (or 2,000 pounds) on board. You would probably never want to take that many guests at one time, but the point is that pontoon boats have incredible carrying capabilities plus flexibility for almost every conceivable form of enjoyment on the water. Let’s check this out. Nowhere in Starcraft’s literature or website could I find definitive information on the standard and optional seating arrangements on the 256 Starliner, but certain pictures and the floor plan layout lead to the following. Forward are two facing L-shaped couches/chaise lounge seats providing very comfortable looking seating for three or four. 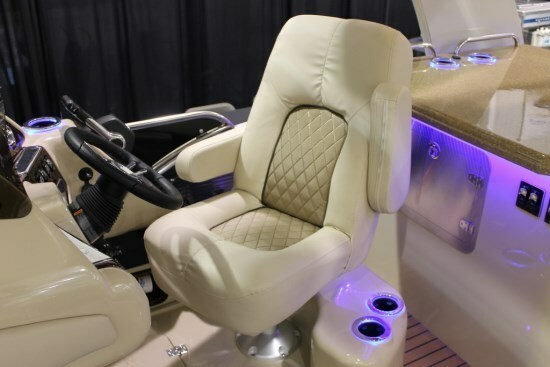 Opposite the starboard side driver’s luxurious looking adjustable helm chair with slider, headrest, and folding armrests are optionally two more portside swivel captain’s chairs with armrests. Aft, between the standard galley unit and standard walk-in change room are four seat bases for available pocket-type portable pedestal seats. All furniture bases are non-wood rotocast. 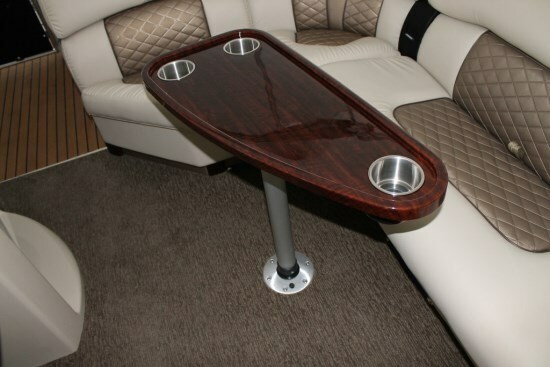 A standard table with built-in cupholders may be augmented with a second similar one, or perhaps opt for the neat cooler table as your second one. An optional refrigerator is available for the galley unit as is a porta-potti for the change room. 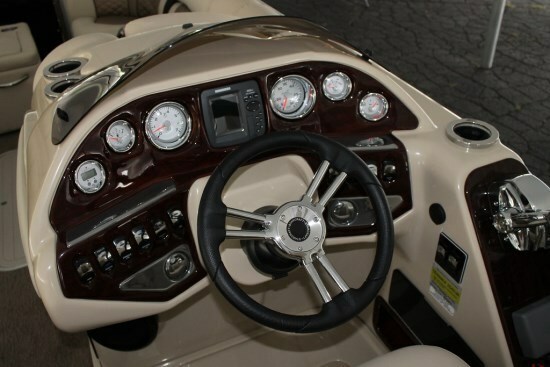 The driver’s custom molded helm console with a windscreen, recessed knee room and footrest is roomy, well laid out, and very easy on the eyes with a full complement of easy to read gauges. 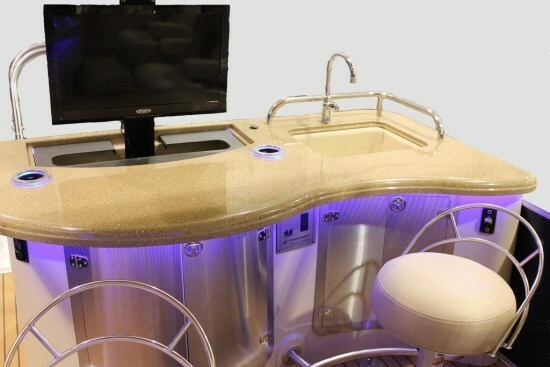 Included is an AM/FM stereo with auxiliary MP3 port and Bose® speakers ingeniously recessed into the seating around the boat. 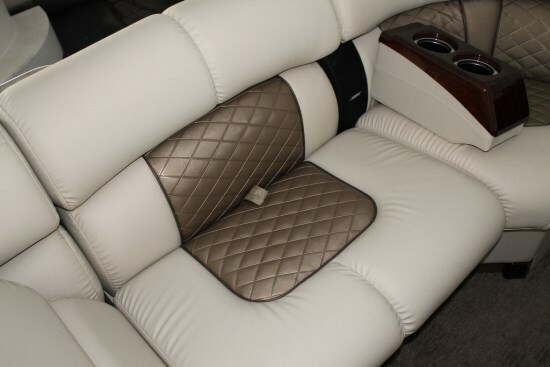 A third 25” tube (pontoon) with a built-in, in-floor storage compartment is optional on the 256 Starliner. Lifting strakes on the pontoons are also optional and should be considered for more efficient running at higher speeds or if watersports are a part of your on the water enjoyment. Aluminum bottom skin is standard and sculptured 28-oz. carpet is the standard flooring material or vinyl is optionally available with or without snap-in carpet. Other notable standard features include courtesy lighting, docking lights, underwater lighting, and even blue LED lighted cupholders. Babbito underdeck lighting is also available to complete the evening mood. For full evening or foul weather enjoyment, consider several canvas options from full or partial enclosures to join the standard ten-foot bimini top and colour-coordinated playpen cover. 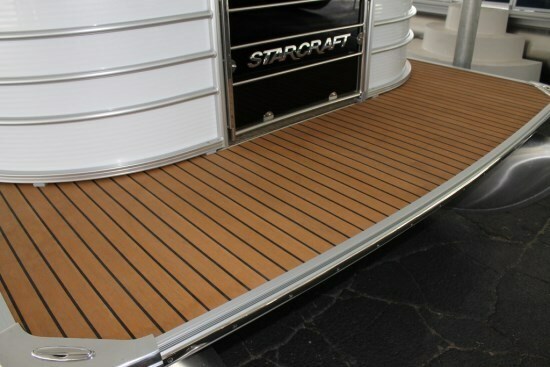 Make sure to ask your dealer about the radial arch option with retractable bimini top. The 256 Starliner allows you to select from five basic colour choices. Pull-up cleats, shore power, hydraulic steering, and a ski-tow attachment are all standard as are an aluminum swim platform and a boarding ladder. Maximum outboard power is rated at 200 horsepower with two pontoons or 250 horsepower with the optional third middle tube.